I am a big Martha Grimes fan, mostly her Richard Jury detective series. She has a few other non-jury books and series, but the only one I had read until The Way of All Fish was it's companion Foul Matter. Both books are a kind of dark comedy set in the publishing world. There's plotting and back stabbing and hit men and neurotic or not-so-neurotic authors. Ruthlessness and a bit of hijinks. I thoroughly enjoyed Foul Matter when I read it many years ago, but I have to say I only moderately enjoyed The Way of All Fish. On the positive side: Grimes' spot-on descriptions and elegant writing, well-drawn characters, good dialog, and an interesting plot. On the negative side: I feel like the book spent a lot of time on the set up. Like, 2/3 of the book easy, maybe even 3/4 of the book felt like a set up for the last third or fourth. There was a relatively large cast of characters, and I kept getting mixed up and bogged down. I enjoy a good slow paced book, but this book felt like it was slow paced when it should have been fast-paced. So it wasn't bad, per se, it just didn't hit the sweet spot for me. 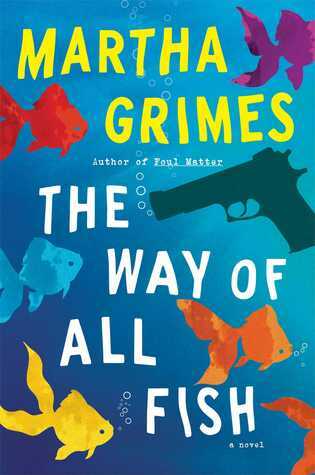 Bottom line: if you're a fan of slow-paced con stories, you might enjoy this, but it's not my favorite Grimes story. 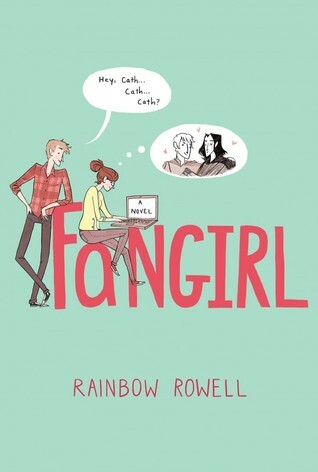 Fangirl is the story of Cath, a girl who'd rather be writing Simon Snow fanfiction than just about anything else. Cath and her identical twin Wren are off to their freshman year of college. Wren can't wait to get out and experience life, but Cath would rather stay home and keep an eye on their dad -- a loving single father who struggles with bipolar disorder. Cath would rather spend her days in the fantasy world of Simon Snow than just about anything else. But Cath moves into her dorm room and begins a year that will surprise her. A year of learning to make friends, branch out, and let go (just a little). She discovers a lot about writing and how collaborating can be fun and fulfilling, and how sometimes writing something one hundred percent of your own making is scary and hard. Fangirl has a lot of stuff going on: family drama, mental illness, romance, and your basic college stuff -- roommates and professors and classmates and ethics. I know some readers thought the book would have been better had there been maybe one less "issue", but I thought Rowell did a great job of keeping everything realistic. Seeing Cath's journey during her first year away from home was delightful, and yes, at times sad and somewhat painful. But that's life, right? Funny and heartwarming and sad and painful all at the same time. Rowell also really did a great job with the relationship dynamics in this book. Cath and her sister Wren, Cath and her Dad, Cath and Wren and their mom, Cath and her roomate and classmate and friend and love interest. All of it really felt true and genuine. And I like that there wasn't just one relationship focus. I'd also be remiss if I didn't mention one of the most fun things about the book, and that's the shout out to "fandom" -- the ins and outs of being a super fan, connecting to other fans, writing or reading fan fiction. Anyone who's ever loved a book or tv show or movie or artist in a somewhat all-consuming way will appreciate that aspect of Cath's life and the way Rowell wrote it. Bottom line: pick this book up if you are in the mood for something sweet, poignmant, and a little bit funny. 1. Wednesday means....new podcasts day! My two favorite podcasts -- Happy Hour with Jamie Ivey and Marriage is Funny both post new episodes on Wednesdays. The real challenge is picking which one to listen to first! 2. Speaking of podcasts, there were two episodes of Happy Hour that really encouraged me this past week. The first, was last week's guest Jana Magruder . She and Jamie were talking about age and how they were really enjoying this middle season of life (late 30s, 40s). They talked about the confidence that comes at that age that can't always manufacture when you're young, and how it really feels like there's so much life left to life. And Jana mentioned Julia Child -- an icon, a successful woman by anyone's standards -- who had never even been to France until she was 37. What a good reminder that in our youth-obsessed society, there are so many good seasons in life, and you can invent or reinvent, discover new passions or refine long-held passions at any time. I turned 37 this week, so it seemed even more timely. I also listened to a back episode this week with the author Sally Lloyd-Jones. I LOVED listening to this guest. She was so gentle and funny and wise and interesting. She talked at one point about approaching life trying to be excellent in everything you do. She applied it specifically to artists of all kinds, but really to anyone in whatever you're doing. You can't be perfect, and shouldn't try to be because you never will measure up to that. But you can bring excellence and strive for excellence. 4. A short-long list (is that a thing? Well, it is now). Happy hump day! Welcome to the land of Fairy Tales. Where the Princes Charming have actual names, the Princesses don't need saving, the biggest villain in all the kingdoms is a 10 year old sociopath, and the Bards take plenty of poetic license when retelling a story. The Hero's Guide is a delightful middle grade (3-6 grade) book that turns some of the classic fairy tales on their head. We may know the "official" version of how Prince Charming (Frederick) freed Cinderella from her wicked stepmother, but what do we REALLY know about Prince Frederick, or Princess Ella, Rapunzel and Prince Gustav, Snow White and Prince Duncan, Briar Rose and Prince Liam? The Hero's Guide picks up after the "Happily Ever After," where life isn't happening exactly how you might expect for the Princes and Princesses. The witch from Rapunzel begins plotting an evil scheme, and Princess Ella sets off to figure out what happened to her kingdom's Bard and find some adventure in the process. Prince Gustav sets off to prove himself to his 16 older brothers, Snow White tells Prince Duncan to go take a walk, Prince Liam discovers his own kingdom loves gold more than they love him, against his better judgement (and the advice of his father) Prince Frederick sets off to find Ella. Before long, the Princes have banded together to save the day, but things don't exactly go according to plan. 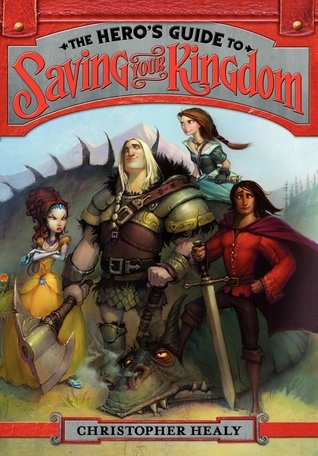 The Hero's Guide to Saving Your Kingdom is fun and funny, and doesn't take itself too seriously. If you know a big kid (or are ocassionally a big kid yourself) who likes fairy tales, pick this book up. It's the first in a series, so the fun doesn't have to stop! I've always wanted to be the hero. Doesn't everyone feel that way at some point? We all want to be the one who saves the day, the one who can do it all. But some of the most-loved stories aren't just about the hero or heroine. Where would Frodo be without Sam. Harry without Ron and Hermione (and Luna and Neville...). Sherlock without Watson. Rand without Mat and Perrin. Rory without Lane. Lorelai without Sookie. Buffy without Willow and Xander? (we know that at any rate: self-destructing in a major way). And Star Wars isn't just about Luke or Darth Vader. Sometimes, we're the one carrying the ring. Going through the fire that nearly destroys us. Sometimes we're the one with the power, responsibility, and the burden that comes with it. Sometimes we're the one that life knocks down a few times. But sometimes, we're the person standing right there making sure that our friend comes through the fire. Picking them up when they can't go on. Reminding them that despite everyone and everything that seemingly has it in for them, they are loved. Providing magical backup, an extra gun hand, a getaway ship, a silent hug and listening ear, or a loving kick in the pants. (and sometimes even a well-timed moment of comic relief). The friend fills in the gaps, because even heroes can't do it all alone. I've had conversations with teenagers when they begin to realize that a lot of their friends or peers experience some pretty awful stuff. People whose lives are not marked by trauma can start to feel guilty. But I remind them that someone has to stand along side those who are hurting and broken. Someone has to be the friend. It may not be glamorous, but it's so necessary. Sometimes, we're the protagonist. Sometimes, we're the friend. And it all makes a good story.